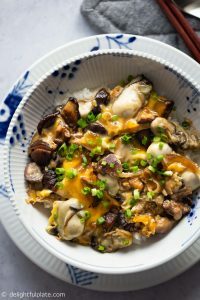 This Mushroom Oyster Rice Bowl (Oyster Donburi) features sweet and plump oysters and earthy shiitake mushrooms, simmered in an umami sauce and then served with fluffy steamed rice. 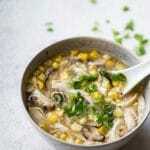 A delicious, easy and healthy one-bowl meal that comes together in less than 30 minutes. Donburi is a Japanese rice bowl dish consisting of ingredients such as meat and vegetables simmered together and then served over rice. You probably have tried some popular Japanese donburi such as gyudon (beef rice bowl), oyakodon (chicken rice bowl) and katsudon (pork cutlet rice bowl). 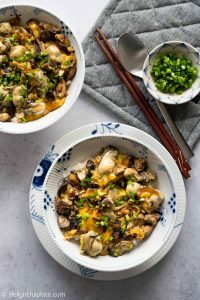 This Mushroom Oyster Donburi is inspired by a donburi I had at a local Japanese restaurant recently. Plump and fresh oysters are simmered with onions, fresh shiitake mushrooms and beaten eggs in a savory sauce. It is light with umami flavors and different textures. I love the yummy combination of sweet and briny oysters, earthy mushrooms and silky eggs in this dish. You will be surprised by how well oysters and eggs pair together :). 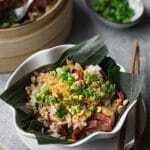 In addition, you will need only one pan and less than half an hour to get this mushroom oyster rice bowl ready. 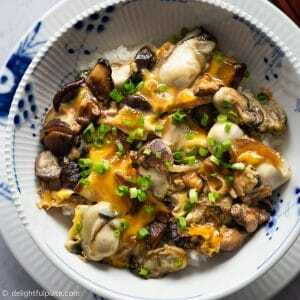 To make this oyster donburi, you will need shucked oysters, fresh shiitake mushrooms, onions, and eggs. For this dish, using fresh ingredients will produce the tastiest results. I use oysters shucked the same day by my fishmonger so I give them a quick rinse to make sure there’s no unwanted sand or dirt. If you want to shuck the oysters yourself, you should buy an oyster knife to make the task less… painful :). I like this How to Shuck an Oyster guide by Serious Eats. If you cannot find fresh shiitake mushrooms, you can use other Asian mushrooms such as shimeji (brown beech) mushrooms. In fact, my local Japanese restaurant used king oyster mushrooms in their oyster donburi, but I like to have the earthiness of shiitake mushrooms in this dish. 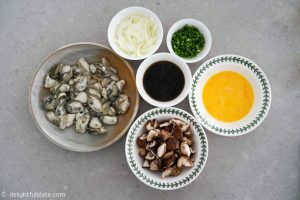 You will also need the following ingredients to make the sauce: dashi, soy sauce and mirin. If you don’t have dashi (or don’t know how to make dashi), just use chicken stock instead of dashi and I guarantee it will be equally delicious. If you happen to have sake in the house, adding a small spoon of sake to the sauce will enhance the flavors but it’s not a must. You will need only one frying pan to cook this dish. Depending on the size of your pan, you can cook 1-2 servings at a time. I use a 11” Scanpan skillet to cook 2 servings. 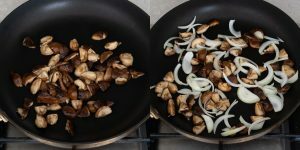 The first step is to sauté the mushrooms to reduce their water content and concentrate the flavors. Once the mushrooms have developed some nice colors, add the sliced onions to the pan and sauté until fragrant. After that, add the sauce and oysters and simmer gently. We add the beaten eggs at the end and cook just until the eggs are still a little runny, silky and moist. Try not to overcook the oysters and the eggs :). 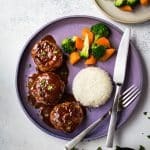 Another easy and delicious Japanese dish I love to eat is this Hamburg Steak with rice and vegetables. Prep all ingredients: slice shiitake mushrooms into bite-sized pieces, slice onions, beat the eggs. Whisk together dashi (or chicken stock), mirin and soy sauce to make the sauce. Place a pan over medium high heat. Add oil and then add shiitake mushrooms and sauté until mushrooms start to develop nice colors. Then add sliced onions and sauté until fragrant. Season with a pinch of salt and black pepper. Pour the sauce into the pan and let it come to a boil, then reduce heat to a simmer and cook for 45 seconds or so. 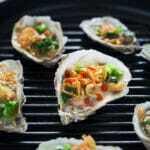 Add oysters to the pan, evenly distribute them in a single layer. Cover the pan and simmer for a minute. 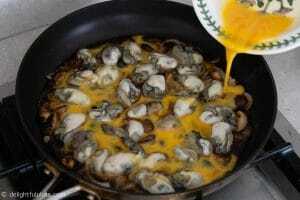 Remove the lid and drizzle the beaten eggs slowly and evenly over the oysters and mushrooms. Cover the pan again and cook with medium low heat for 1-2 minutes, just until the eggs are still a little runny, silky and moist. Add cooked rice to serving bowls and top with the oysters, mushrooms and eggs. Sprinkle some sliced scallions and serve immediately. The fresh the ingredients, the tastier the oyster rice bowl will be. I use oysters shucked the same day by my fishmonger so I give them a quick rinse to make sure there's no unwanted sand or dirt. If you cannot find fresh shiitake mushrooms, you can use other Asian mushrooms such as shimeji (brown beech) mushrooms. If you happen to have some sake in your pantry, whisk together a tablespoon of sake with dashi (or chicken stock), soy sauce and mirin to make the sauce to enhance the flavors of the dish. Depending on the size of your pan, you can cook 1-2 servings at a time. I can cook 2 servings at a time with my 11'' skillet. If yours is only big enough to cook 1 serving, dividing all ingredients in half. Be careful not to overcook the oysters and eggs. Adjust heat as needed while cooking. 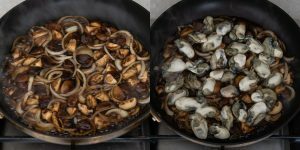 Cooking time may differ depending on your stove the the size of your oysters. The nutrition calculation below does not include rice.